gemstoneking has no other items for sale. Sales tax may apply when shipping to: AL(9.36%), AZ(11.7%), AR*(8.57%), CA(8.369%), CT*(6.35%), FL*(6.853%), GA*(7.33%), IL*(6.25%), IN*(7.0%), IA*, KS*(8.594%), KY*(6.0%), MD(6.0%), MI*(6.0%), MN*, NV(7.883%), NJ*(7.0%), NY*(8.875%), OH*(7.197%), OK(8.91%), PA*(6.098%), SC*(7.298%), TN*(9.25%), TX*(7.43%), VA(5.457%), WA*, WI*(5.389%). Look like the real thing!! these earrings are just a bit over 1 1/2 carats each and truly look like real diamonds. i am so impressed by the way they look so real, i really feel good when wearing them. i have never seen cz look so real before. i am on my way to purchase more. One of the earrings was missing the stone. It wasn't in the package or the envelope. So I actually only got one pair. The other pair is useless. 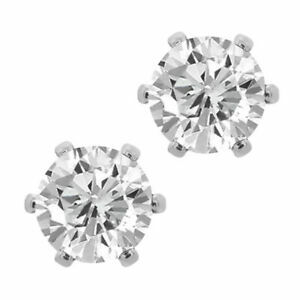 I wear these instead of my diamonds because they look just as good, and I'm not afraid I'll lose one.